On this page I am sharing these very elegant Free Printable Bridal Shower Gift Bingo Cards. 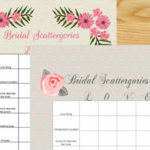 I have made these cards in five unique colors and designs to suit your bridal shower party’s needs and match your bridal shower party’s theme. 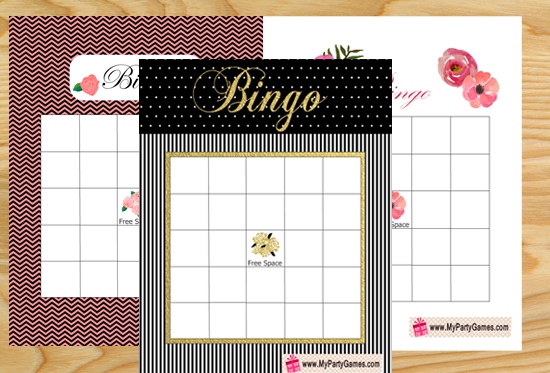 You should print these game cards one day before your bridal shower party and according to the number of your bridal shower party guests. 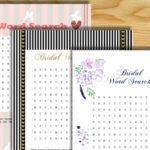 Print and distribute the bridal shower gift bingo cards among the guests of bridal shower party along with a pen and ask them to write down the gifts they think bride-to-be will be receiving that day. 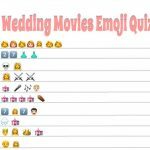 when the bride will start opening the gifts, ask the guests to cross the name of the gifts they have written if the name matches the gift that bride-to-be has opened. 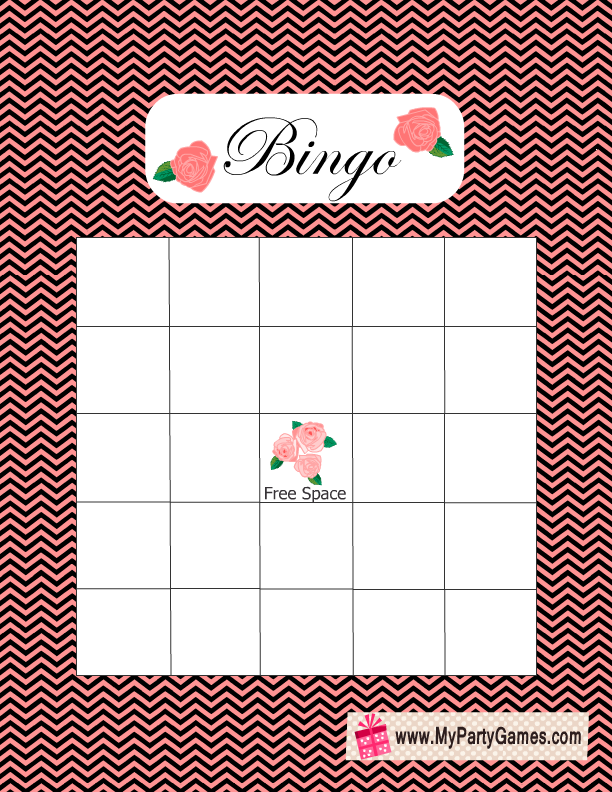 The guest who a complete horizontal, vertical, or diagonal row complete first and shouts the word “BINGO” will be the winner. 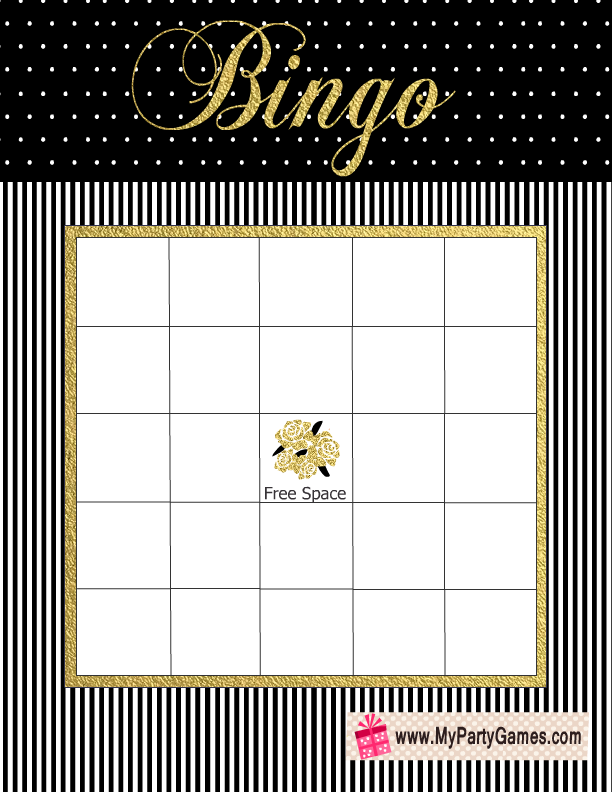 This is my personal favorite and very elegant Bridal Shower Bingo Card in Black,White and Gold colors. 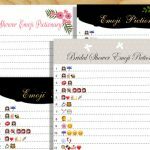 The Gold will not be printed as gold but it will just look like a matte golden color when printed. 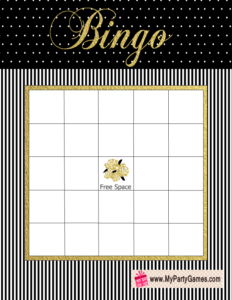 This card has a black and white striped background and header has small dots. 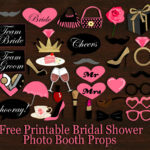 I absolutely love it’s design and I am sure that your bridal Shower party guests will love it too. Just click on the small image of this game and a bigger image will open up, right click and save that image. You can adjust the size of the game card through your printer’s properties. 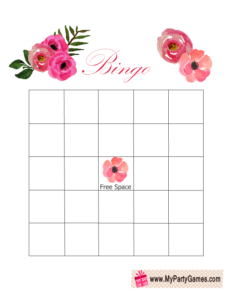 This is another simple yet very beautiful free printable bridal shower gift bingo game card decorated with beautiful flowers. 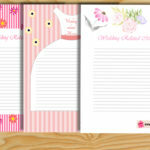 The flower image are a freebie courtesy thesmellofroses.com. 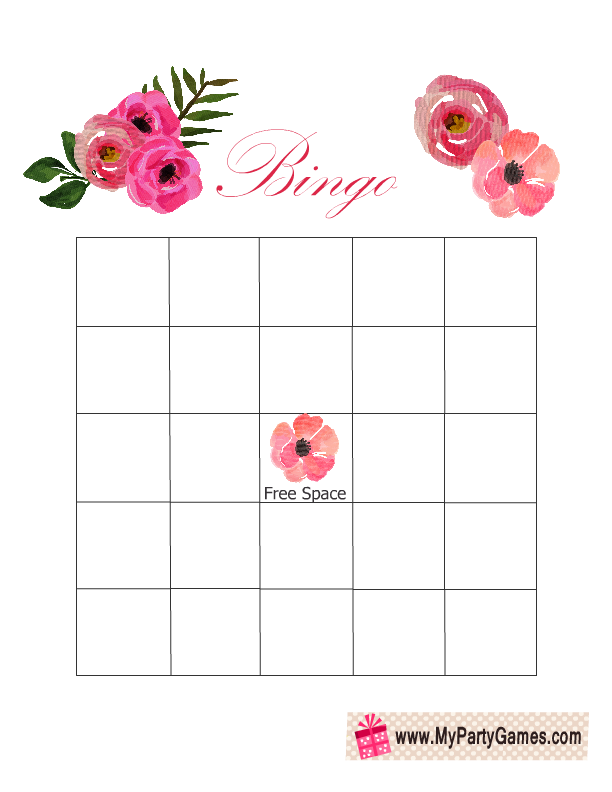 It is an adorable bingo card and it is also won’t use much ink. Here are three beautiful Free Printable Bridal Shower Gift Bingo Cards with Chevron Pattern and in 3 beautiful colors. 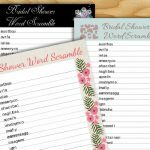 These cards are suitable for a shabby chic bridal shower party but these will be equally liked on a modern bridal shower. 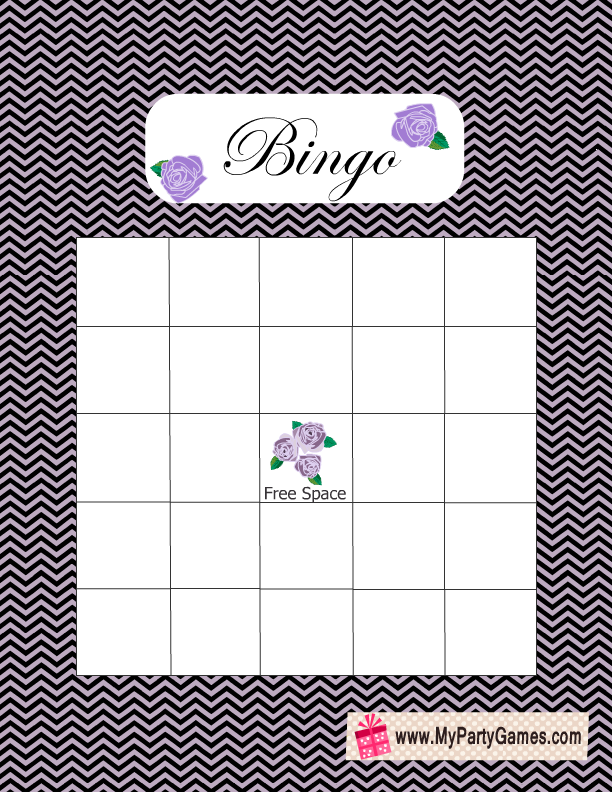 You should click on the card in color of your choice and then right click and save the bigger image when it will open up. 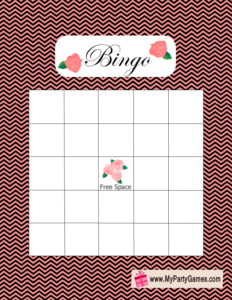 These free printable bridal shower gift bingo cards look elegant in chevron of every color. 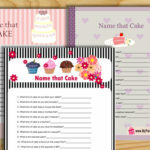 Please leave your comments and suggestions below and keep on visiting my website.